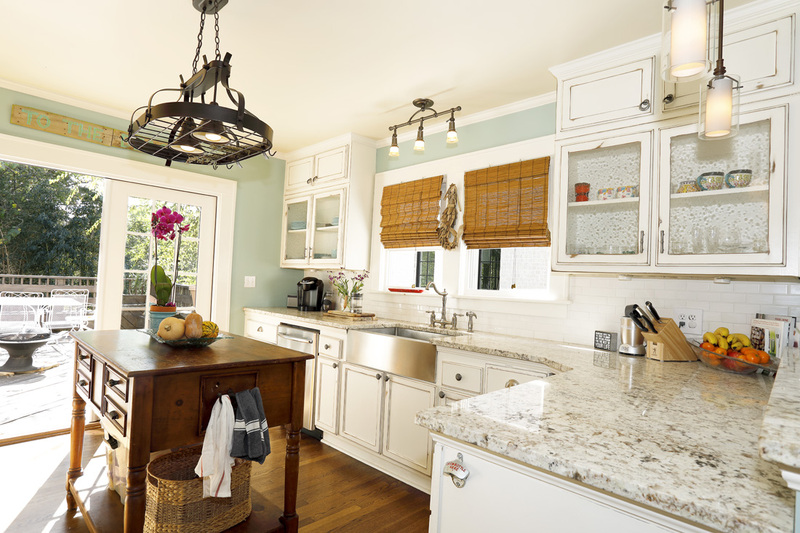 Interior designer Angelika Taylor turns her family’s 1925 Virginia-Highland bungalow into a beach-inspired retreat. Joseph and Angelika knew their 1925 bungalow was an architectural gem. When Angelika and Joseph Taylor drove by the 1925 bungalow on Virginia Avenue in Virginia- Highland, they knew the house would be their next home. It wasn’t because it attracted attention for its beauty. On the contrary, “It was a total dump,” Joseph says. “But it had great curb appeal and beautiful gables.” Angelika says they loved how cute and original it is, plus, the location couldn’t be beat. There was just one problem: The house wasn’t for sale. But that didn’t deter the couple. They walked up to the front door, knocked and, when the homeowners opened the door, made an offer to purchase the home. Unfortunately, it was declined. However, Angelika refused to give up. She wrote a two-page letter explaining why she and her husband wanted to purchase the home. “I poured my guts out in a very personal letter, including the fact that we would never tear it down like we continue to see in our nostalgic town,” Angelika says. “I said we would keep as many original items in the house as possible and we wanted to raise our family there.” The couple’s real estate agent passed the letter on to the homeowners, and, surprisingly, they bit. The Taylors purchased the house in 2011 and set out to renovate it. Texture and color combine to create a cozy, casual living room. Sadly, the previous homeowners hadn’t invested much in maintenance and upkeep. For example, the Taylors wanted to keep the home’s original hardwood flooring, but it had 7-inch dips that had to be leveled out. They also had to insulate the entire house, which had barely any to speak of. However, when removing sheetrock in the front room, which served as an office, the Taylors discovered a pleasant surprise: beautiful brick arches that turned out to be part of the original front porch. “The arches just popped out,” Angelika says. Other renovations included moving some doorways for better flow, reconfiguring the kitchen and adding doors from the kitchen to the new back deck. In addition, they added a solid, wood shingle roof that supports 20 solar panels. “We’re almost off the grid,” Angelika says. 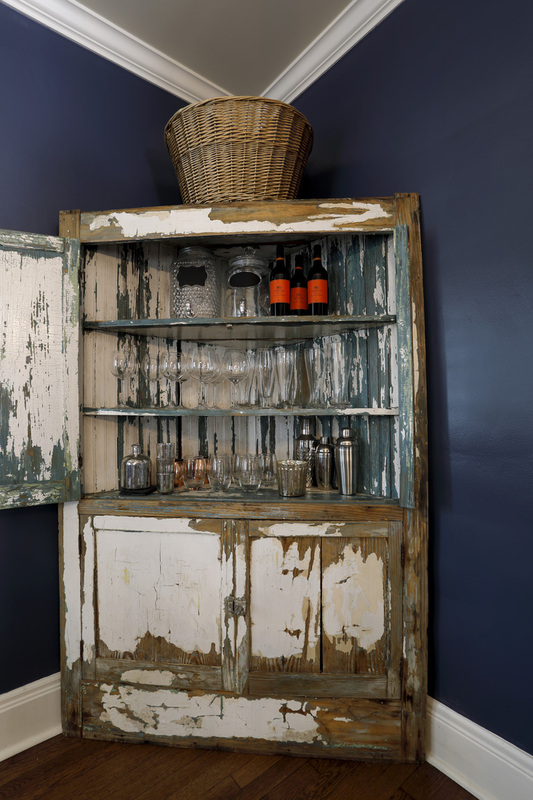 Angelika found and distressed the kitchen cabinets to give them a dated look. 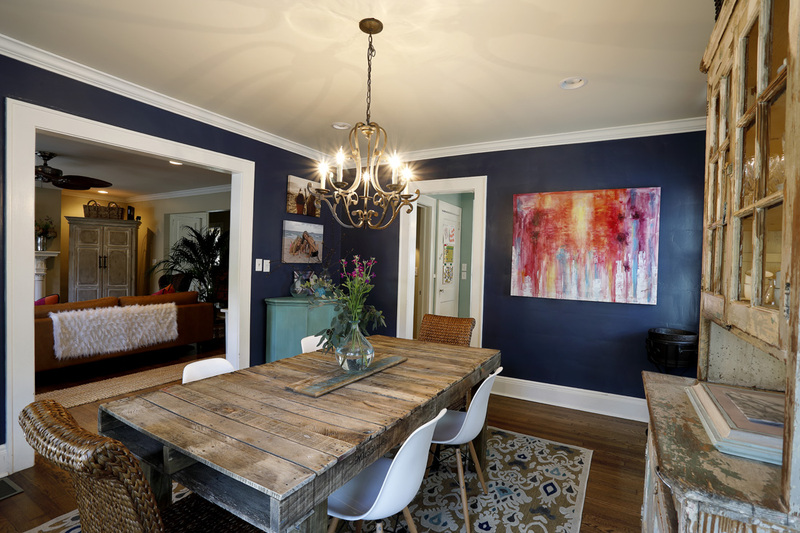 Angelika designed and built the dining table from discarded pallets. 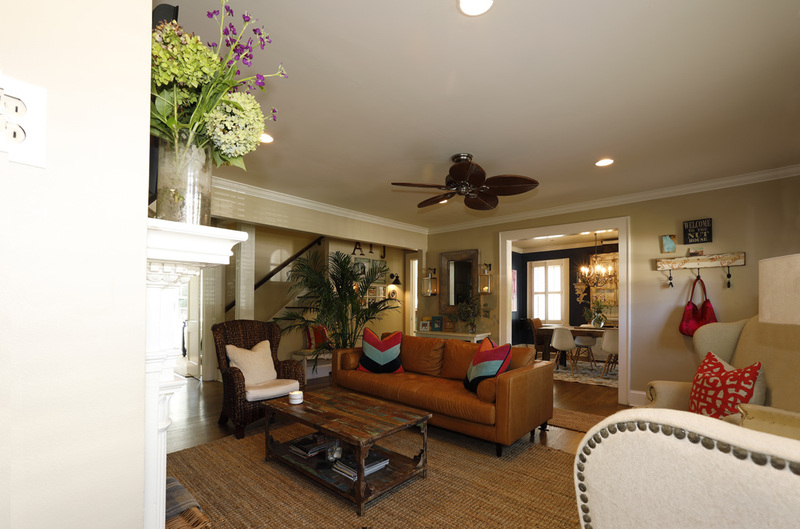 The brown chair in the living room is seagrass, which Angelika used to incorporate a natural touch into the interior. “I love to do a lot of jute and seagrass because they’re textural and neutral,” she says, adding that using natural fibers in a house bring the outdoors in. “I feel like I’m always outside at the beach. Angelika used her own faux finishing techniques to distress the dining room cabinets. 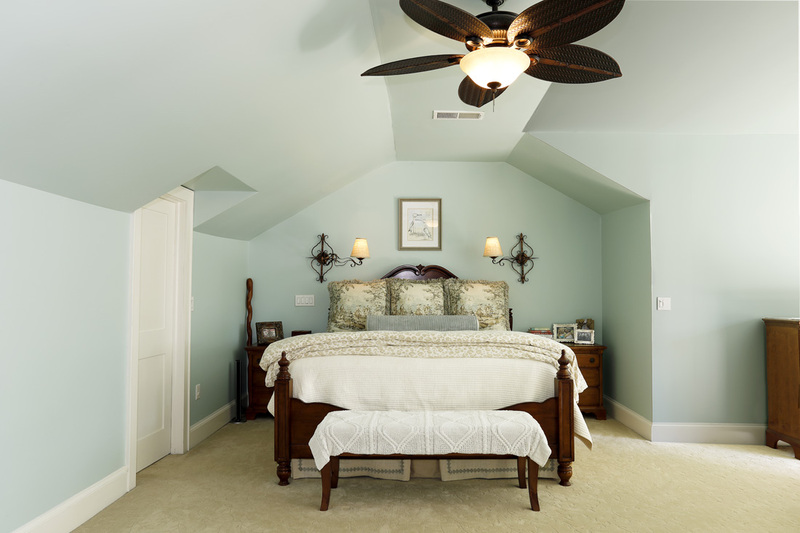 Angelika’s use of aqua in the master bedroom creates a quiet, relaxing space.